Here's a fresh look at the Boulder market, with data through the end of last month. 45 houses sold during December, 18% for more than the asking price. 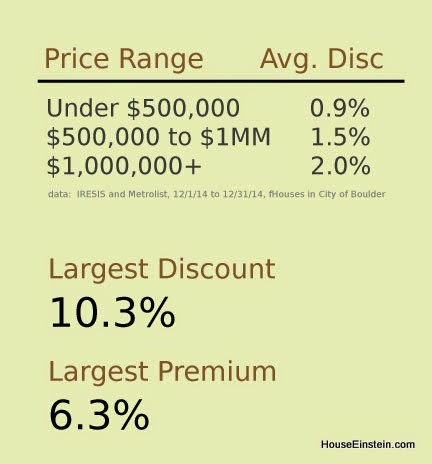 Despite the bidding wars, the median negotiated discount was 1.5%. As prices move upward, so do the negotiated discounts. Within the data set are a few transactions with large discounts and premiums. Market knowledge is power. Mis-pricing is caused by lack of knowledge. It usually results in leaving money on the table. If you're looking for expert advice on buying or selling your next Boulder home, don't hesitate to call. We love helping buyers and sellers make smarter real estate decisions. Note: The next Boulder Real Estate meetup has been scheduled. We'll be discussing market conditions and best practices for bidding wars. We're meeting on January 22nd at 7pm. Space is limited. RSVP HERE.